On her first visit to Job Connection, W.O. spent two hours completing one online job application for a new restaurant opening soon in the Tulsa area. Just 10 days later, she called Job Connection to say that she had been hired and was currently in training for the position she had applied for at that restaurant. The next day, W.O. brought a friend to Job Connection to begin her own job search. She also informed Job Connection staff that the restaurant was still taking applications and asked that it be posted on our Job Board for other job seekers. K.C. visited Goodwill Job Connection in November. This was her first visit and she wanted to get help with a resume and review job leads. She returned to continue her job search on 3 more occasions over the next 2 weeks. On her fourth visit, she brought a friend, D.D., who was also looking for employment. Just 12 days after her fourth visit and her friend’s first visit to Job Connection, the same company hired both K.C. and her friend, D.D., at the same time. Both are working full-time with health benefits and overtime options. I decided to see how easy would it be to put together a gift basket thrift-store style. Goodwill® often has a great selection of nice wicker and woven baskets. Priced as low as $1.50, they are cheaper than the $10 to $35 you could pay for full retail price. Baskets are found in the wares at the Southwest Boulevard Goodwill Store. You could fill this woven basket at the Owasso Goodwill Store with candies, holiday jewelry, or bath beads. You can also find decorated baskets like these. I splurged on this basket for $2 at the Owasso Goodwill® store. It’s small and sturdy, which is what I was looking for, and I like that it had color. You could probably find a larger one with a handle for a similar price. Now it was time to figure out what to put in my basket. If you need help coming up with a theme, consider packing it with the person’s favorite things like books or movies or hobbies. Keep it DIY and stuff the basket with homemade holiday cookies, candy or crafts. Or make it a fun family project and hunt thrift stores for odds and ends. I won’t lie: Getting it all to fit and look good took some doing. I could’ve used a bigger basket. I finally got it wrapped with cellophane I bought at a dollar store and a ribbon that was 25 cents at Goodwill. Check out these video for wrapping tips, especially on how to deal with those pesky sides. My basket is ready for delivery! In hindsight, I’d use a more sheer wrapping and arrange the gifts better to make them all easier to see. Total cost to put it together, including tax: $20.19. A gift basket is great for office holiday parties or gift exchanges, or for a present when visiting friends and neighbors during the holidays. And you can save money and give it personal flair if you do it yourself. The National Safety Council gives us good reminders on how to have a safe holiday season. GoodTALK: Goodwill Job Connection "2"
You can track our progress today on Facebook. Thank you for support of Goodwill on this #GivingTuesday and throughout the year. Thanksgiving Day launches the holiday giving season. And Goodwill would love to be on your gifting list. A donation of $100 serves up to 30 TulsaWORKS participants in one weeklong Life Skills session? An annual $120 donation ($10/month) provides transportation for job sampling for students with Autism Spectrum Disorder in our Transition Work Adjustment program for an academic year? An annual $600 donation ($50/month) creates resumes for 30 individuals at Goodwill Job Connection? Shop for gifts on AmazonSmile. Just can’t find it at Goodwill? Well on this special site, Amazon donates 0.5% of the purchase price to Goodwill. #GivingTuesday holiday campaign. This is the third year that the first Tuesday after Black Friday and CyberMonday is devoted globally to giving back, whether in money, time or talent. On December 2, you can commemorate #GivingTuesday by contributing toward our $1,000 goal. See us on Facebook for campaign details. End-of-year tax-deductible donating. Dec. 31 is the last day that you can make a charitable contribution that you can deduct on your income tax return. Contributions can be monetary, made through our website, or gently-used goods dropped off at any of our attended donation centers. If you can, consider giving to Goodwill. Someone in your community will have a brighter holiday for it. SR (name withheld by request) originally contacted Job Connection via telephone about employment and other resources for her daughter, who had some physical challenges. During the conversation, SR was provided with information about Goodwill Job Connection and referrals to other community resources, including the Goodwill Supported Employment Program and Department of Rehabilitation Services. 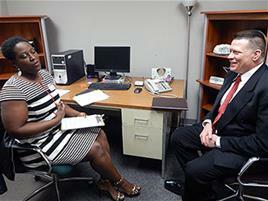 She was also informed about an upcoming job fair scheduled at Goodwill Industries. SR added that she had just been informed that she was being promoted to a management position with a raise in pay. Just a few days after that, SR and her family visited Job Connection to say, Thank You, in person and to update us with news that her daughter was getting the help she needed and that they had just come from an appointment at the Goodwill Supported Employment Program. Goodwill Job Connection’s job search and career services are FREE and provided on a walk-in basis. Hours are 8:30 .am.-5 p.m. Monday-Friday. We have two locations in Tulsa: South Annex, 2800 Southwest Blvd. (918-599-0067) and 1665 S. Yale Ave. (918-747-1334). The recent arctic blast in our region probably has many people thinking about their heating bills. The federal Low-Income Home Energy Assistance Program (LIHEAP) can help eligible households in Oklahoma and Missouri cover those costs. In Oklahoma, the Department of Human Services says that a limited amount of winter heating assistance funds will be made available across the state. The application period starts Tuesday, Dec. 9. DHS will take applications until all allocated funds are depleted. DHS has approximately $8 million in federal funds for this year’s Winter Heating Program in Oklahoma. For Missourians, the Missouri Department of Social Services has begun accepting applications for LIHEAP assistance. Missouri: Download the LIHEAP application with instructions and information on the nearest agency location or visit www.DSS.mo.gov. Sustainable Tulsa and the Tulsa Southside Rotary Club named Goodwill the 2014 winner of The Henry Bellmon Sustainability Award for excellent sustainable leadership. Goodwill Tulsa received the award at the Henry Bellmon Sustainability Awards gala October 9, 2014. The Goodwill model Dr. Edgar J. Helms established more than 100 years ago plays directly to the award’s focus on a balanced approach to quality of life, responsible economic growth, and environmental stewardship. That multifaceted mission drives Goodwill’s work in eastern Oklahoma and southwest Missouri. The mission cycle includes diverting waste from area landfills (more than 18,000,000 pounds last year); allowing shoppers to buy high quality clothing and other goods at affordable prices; and the hiring of individuals with barriers to employment while providing job training and other support to help people find jobs. Goodwill, a past winner of the Responsible Economic Growth Award, is extremely proud and thankful to receive the overall Bellmon award this year. It is a testament to the mission and the support of our community. When Wizard World arrives in Tulsa this weekend, cosplayers will come out, well, to play. The con’s costume contest is Saturday evening. Before then, cosplayers will walk the halls dressed as their favorite character, showcasing a wide variety of styles, themes and levels of complexity. And they're happy to pose for photos. Many cosplayers create their captivating costumes from scratch, even using items bought at Goodwill and other thrift shops. A bed sheet from Goodwill becomes a dress in this stunning Princess Zelda Cosplay by cosplayer AnimeGeer. A thrifted shirt is part of a Taiga Aisaka costume Mia Moore posted on her xo Mia website. Cosplayer Lisa Lou shared her sources for material in an interview with Gamersbliss.com . CelesteZ talks about saving money buying shirts and shoes for a costume in her post on Cosplay Evolved. http://www.cosplayevolved.com/#!thrift-store-cosplay/c1nb5 Update 1/27/15: This link no longer works as the original article has moved. Here is a similar take on her Hubpage. There are devotees to “cosplay thrift,” posting their imaginative designs on deviantart, Tumblr, and Pinterest (you could easily get lost looking at all the great images, just saying). Cosplayers love to share their process as well, with some offering tips, tutorials and how-tos. Anyone interested in participating in the costume contest can sign-up Saturday at the Wizard World Tulsa information booth (#615) and there is no restriction on what material is used or where it came from for costumes. A panel, “Costumes + Playing = Cosplay! So What Does That Actually Mean?” is scheduled for Friday evening. So, cosplayers should have a lot of playtime this weekend. Tulsa has its own annual event for cosplayers at the Guthrie Green. Actor Lou Ferrigno talks about overcoming a disability to become TVs ever-lovin’ Incredible Hulk in the Tulsa World Weekend section, which is devoted to Wizard World Tulsa. On Friday, the panel “Charlie Christmas: Journey Of An Oklahoma Super Hero” focuses on a feature-length micro-budget vigilante movie, created and shot entirely in Oklahoma. Check out the online program guide to plan your trip to Wizard World Tulsa. Still don’t have a costume for Friday? We can help. Zombie, pirate and vampire costumes are trending in the list of do-it-yourself (DIY) costume choices this Halloween, according to a Goodwill® poll. Ninja turtle, Spider-Man® and zombie were tops for boys, while girl’s preferred princess, witch and fairy. The phone survey (ORC International Research) also found that 62 percent of women preferred DIY costumes over packaged products, compared with 57 percent of men. Goodwill Costumes to DIY for Contest! If you do prefer ready-made costumes, we can still help you out. All Halloween costumes will be 50% off through this week in our 11 stores. When it comes to a DIY Halloween, Goodwill® has the goods. Goodwill has Halloween wares and decorations, as well as items for homemade projects. Many shoppers know we have clothing, accessories and props to create that unique costume. We also have tons of household items for making homemade Halloween decorations. Mason jars, containers and dishware. Even craft paper, yarn and material. And it’s all at a fraction of the cost of buying retail, while supporting our many job training programs. So, let’s get those creative juices flowing! Visitors will wonder who's watching with these simple to make "spooky eyes" from the DIY network. Mason jar luminarias are a cute way to welcome trick-or-treaters, by Anything & Everything! Follow Goodwill Industries of Tulsa's board Upcyclers Unleashed! on Pinterest. Nikol Mayfield didn’t have much when she moved to Oklahoma, just her two young children and their clothes. She didn’t have a job, either, which actually came as a surprise. Nikol Mayfield, 38, is a sales associate at the Southwest Boulevard Goodwill® Store. Her former employer in Tennessee had worked out a transfer. But on her second day with the company in Oklahoma, Mayfield was informed that there was not a position for her. Mayfield felt stuck, even living with her brother in Glenpool. His home was close to a Goodwill® store. Familiar with the stores from her childhood in Louisiana, Mayfield took a chance and stopped in. Things began to change for her soon after. Just 14 months later, Mayfield and her children now have their own 2 bedroom apartment. She has a car to get to her job at the Southwest Boulevard Store, where she’s worked since January. Goodwill has treated her like family, Mayfield said. People such as Glenpool store manager Debbie Timmons, who was moved by Mayfield’s situation and hired her as a part-time sales associate in August 2013. Timmons later recommended Mayfield pursue a transfer to a full-time position at the Southwest Boulevard store. When Mayfield hesitated because she didn’t have a car, Timmons steered her toward transportation options. Mayfield feels the same family spirit at Southwest Boulevard working with store manager Jaime Monroe and her team. “They inspire me,” Mayfield said, nodding for emphasis. Goodwill is helping Mayfield achieve another victory — finishing her high school education. She dropped out when her mother became ill to help out in a household with four children and a father who was a quadriplegic. Goodwill Tulsa recently started a GED training program through a partnership with Union Public Schools. Mayfield was encouraged to enroll. And when she thought about her own children, one a valedictorian headed to Oklahoma University, the other looking to graduate and attend Tulsa University, she felt the timing was right. Goodwill sales associate Nikol Mayfield is thankful for the support from Southwest Boulevard store manager Jaime Monroe (right) and others on the management team. Mayfield feels she is really learning in the class, unlike past attempts. Instructor Charlie Weeks’ teaching style eased her nerves. The students also collaborate on their lessons and help each other learn. Mayfield is confident that she will pass the GED test. From there, she wants to pursue a degree in business management. She has a positive outlook thanks to her Goodwill experience. Mayfield hopes her story would inspire others to seize opportunities to better their lives. Preparation is a key component of a successful interview. You should research potential employers beforehand in order to see how you best fit in fulfilling their mission -- and then convey that during the interview. These are the companies and agencies participating in our 2014 Fall Job Fair, Thursday, Oct. 2, 10 a.m.-2 p.m. Do your homework on those who interest you by following the links. Oversees public housing for Tulsa citizens as well as educational, employment and social programs. Continued summer-like weather might suggest otherwise, but the calendar says fall has arrived. You can turn what you already have into stylish fashions for the new season. Fashion Diva Design came up with these great DIY ideas that keep up with the latest fashion trends without spending a lot of money. Paint, dye and felt needles were the tools for these projects from Babble. Of course, Pinterest is always a great place to find inspiration. Now, back to that lingering warm weather. Maybe you’re not quite ready to jump into long-sleeve sweaters and turtlenecks. No worries. Here’s a few ideas to make the wardrobe changeover easier from Patrice J. Williams (@flyonadime) and our friends at Goodwill NYNJ. What do you like to wear for the end of summer/early fall season? For Jimmy Johnson, the chance to earn his latest certification came as a surprise. Jimmy Johnson (right) shows a copy of his CompTIA A+ certification, which he earned after taking Shawn Thomas’ (left) class at TulsaWORKS. The transplanted Texan was at a TulsaWORKS orientation to sign up for the private security training course. Johnson had been unable to find a job in IT, which he had studied in college. So, he was feeling forced to fall back on his background in security; he held a Texas license, but not a CLEET certification for Oklahoma. However, during orientation, there was a mention of a new offering, the CompTIA A+ certification training course. It was so new, the class hadn’t even made it on the course listing. CompTIA A+ is the entry-level certification for the information technology field. The certification shows the holder has the technical skill and knowledge to work with PCs, and having one can launch a career in IT. Johnson initially learned to fix and set up computers on his own. As a Navy veteran, he took a course at Paris Junior College in Texas through the Veteran Retraining Assistance Program. He graduated with a 3.8 GPA, but felt the course was too light on technical, hands-on training. Afterwards, Johnson did an internship of sorts and continued his self-study. The chance to earn the A+ certification, however, eluded him. And 7 months later, Johnson found himself in Oklahoma, thinking all of his schooling had been a waste of time and energy. The class at Goodwill changed that. Johnson is the first graduate of the TulsaWORKS course to take and pass the A+ test. “This class is what helped me to pass this exam,” he said. Johnson is already studying to earn the CompTIA Network+ certification. The Goodwill class helped him to grow, Johnson said, and he wants to continue that process. Goodwill Tulsa is so grateful to the wonderful volunteers who supported us on United Way Day of Caring 2014 this past Friday. About 40 folks from DHS, D&L Oil Tools, Tulsa Technology Center, Williams and Workforce Oklahoma gave their time to help various Goodwill divisions. In some cases, their service put them face-to-face with our clients, giving the volunteers a chance to see our mission in action. This happy group volunteered at Goodwill Tulsa headquarters Friday. They sorted donations, assisted job seekers, and worked with staff at the Southwest Boulevard Store. We also had volunteers at the Garnett and Broken Arrow Stores. TulsaWORKS mock interviews in full-swing at the South Annex on Friday. Goodwill East Campus Industrial Services held its annual picnic Friday, with help from volunteers from Williams. Everyone listens in for the next bingo number. Volunteers from Williams help Goodwill East Campus Industrial Services workers watch their bingo boards during the group picnic Friday. Goodwill Job Connection Branch Manager Clarice Floyd put together a special tribute to its volunteers. Share how your organization contributed to or benefited from the Day of Caring. I was recently placed by my temp agency to be a volunteer at Goodwill® Job Connection on Southwest Boulevard, Tulsa. Little did I know that, not only would I be able to help people as a volunteer, but I’ve touched people’s lives as well! My first assignment was to make phone calls to follow up on clients’ job searches. I thought, “Just call people and ask them if they’ve found a job,” but after hearing some of their stories, I really “connected” with these people and heard about what they’ve gone through in life to be where they are. Life isn’t always fair and I’m not one to judge since everyone has bumps and bruises as they endure life’s adventures and travels. Sometimes life’s “speed bumps” just appear and it is what it is. Life Just Happens! Recently, I took the approach of asking clients to “come in and get a little more help” in their job searches in addition to checking on their job search. Recently, a few clients came in after speaking on the phone with them, just to meet me face to face and say, “Thanks, A.J.! You made a difference!” and to me, that makes ALL the difference in just “having a job” and “making a difference” in people’s lives. What I’ve heard the last few days from these clients has made this “job” more meaningful to where you just can’t put a price on what I’m doing here at Goodwill! It makes me glad I am here. It’s worth it! All things and all people can be put to good work in God’s perfect plan and I’m honored to be part of the Goodwill experience, even if it’s not permanent. Teachers in the U.S. spend up to $1,000 of their own money annually on classroom supplies, according to AdoptAClassroom.org, an organization that raises money for school supplies. At Goodwill®, stock changes daily, meaning teachers can find what they need throughout the school year — and at thrift store prices. 1. Goodwill’s two full line book shops in the Southwest Boulevard and Garnett locations are a great resource for homeschoolers and teachers looking for supplemental reading material. 2. Teachers can shop Goodwill for videos and DVDs for learning and pleasure like these at the Southwest Boulevard Store. 4. Teachers can frequently comb the wares shelves at Goodwill for items to organize or add interesting touches to a classroom. Teachers, what else do you find for your classrooms and students at Goodwill? Share below or tweet @goodwilltulsa with the hashtag #good4teachers5. We also want to congratulate and thank the Tulsa Community Foundation for its efforts in raising $40 million in planned giving pledges to benefit local nonprofits. Goodwill Tulsa is proud to have played a part and is extremely grateful for the support from TCF and the Tulsa community. Last Friday, Phil Lakin, Jr., Tulsa city councilor and executive director of TCF, climbed to the top of the Golden Driller’s derrick. He then unfurled the banner to a small cheering crowd below. To keep your personal information safe, you follow the common rules of thumb and shred everything. Is there anything you still might be missing? “Everything means everything with even part of your name and address, birthdate, social security number, insurance number, driver’s license number, bank/investment account, etc.,” advises Karla Davis, Goodwill Tulsa’s Finance and IT Director. So, it is also smart to shred documents that contain your name and just one other bit of information. Identity thieves can easily match up even the smallest details and do a lot of damage while pretending to be you. The Federal Trade Commission advises shredding insurance forms and physician statements. Envelopes with identifying information should be shredded. You might feel obligated to keep certain documents around, but many are best shredded as soon as they are no longer useful. Old insurance policy documents, tax returns and pay stubs, for instance. Consumer Reports offers guidelines on how long to keep documents (seven years for tax returns and related items; until after verifying W2s or up to one year for pay stubs). Others suggest shredding expired visas and passports. While they hold sentimental value, they also can be dangerous in the wrong hands. If your circumstances require holding on to them, do so in a secure way like in a safe deposit box. If you don’t own a strong enough shredder or have a large pile of documents, Goodwill East Campus Industrial Services offers secure document shredding for individuals and businesses. Keep separate receptacles for general trash and items to shred. Remove mail, especially bills, from mailbox as soon as possible. Consider dropping payments and other outgoing mail off at the post office or in collection mailboxes. Have new checks delivered to the bank, not mailed to you. What other not-so obvious personal documents do you recommend shredding? TulsaWORKS participants were back at the Tulsa Area United Way this past week — counting, sorting, bundling and packing. All in support of the upcoming United Way annual fundraising campaign. Goodwill volunteers have prepared the campaign material packets that are sent out to companies across the service area for many years running. The effort provides valuable volunteer experience for TulsaWORKS students and is a huge help for the United Way. This past week, 14 volunteers pitched in. On Wednesday, the workroom buzzed with happy chatter and Top 40 radio tunes. Spirits were high and smiles were all around. Conversations ranged from favorite movies to Shakespeare. The production moved on schedule and the project was complete by week’s end. TulsaWORKS instructor Parrish McDaris gathers United Way campaign materials bundled by class participants. The work was part of Goodwill’s annual volunteer project at Tulsa Area United Way. TulsaWORKS participant and volunteer Michael Golligugh (left) and program instructor Parrish McDaris chat as they bundle United Way campaign materials at Tulsa Area United Way. We are one day away from the grand opening of the 3110 Southwest Boulevard Goodwill® Store. Here is what's planned for our guests during the 3-day celebration. Ribbon Cutting Ceremony: 8:45 a.m., with the Tulsa Metro Chamber and the Southwest Tulsa Chamber. Tulsa Shock: Until 10 a.m., meet the WNBA team’s mascot Volt and a giveaway of limited amount of free tickets for Thursday night's game. Door prizes, including a $100 Goodwill Shopping Spree. Come to shop. Come to see the new digs. Come to learn more about Goodwill’s programs. Or just come for the fun it. Whatever the reason, we think it will be worth the trip. Everyone should be able to feel safe in one’s home, whether living with a big family, roommates or alone. High-tech security systems might be outside our budgets. Allergies complicate having a dog. What other steps can be taken to prevent burglaries and home invasions? Do a safety audit of your property or living area. Look for places where someone could hide or use to gain entry without being seen. Ask a friend or trusted neighbor do it with you, as they might spot things you wouldn’t. Take DIY security measures. These approaches are low-tech and inexpensive. For instance, plant thorny bushes around windows. Just remember to keep them short so they don’t obscure your vision outside. Curtains are not just for show; they provide easy and instant privacy. Household items can be used as noise makers around entry points, like setting up cups or glasses near the door. Install a set of inexpensive motion sensitive lights around windows and doorways, or use solar lights on walkways. And if you have a home security system, set it when you are home. Have a safety buddy. Check in with someone every day at set times. It can be by phone, but an easy way is to also tweet to a private feed or post to group FB page. Make locking up routine. Establish a routine where you check all doors and locks before going to bed or leaving the house. And share it with the kids because even the best-mannered children can forget to pull doors closed all the way. Wear a whistle. Especially if you are often home alone. Or keep one nearby in case of emergency. Create a safe room. Even if it is just a designated place to hide out if necessary. Preferably the room has a phone, maybe a spare mobile phone and another means of exiting the home. Be aware. This is by far the most often recommended tip — and possibly the simplest. It’s not being paranoid to know your surroundings. Watch for things out of the ordinary. Assess situations, particularly when you have to interact with strangers. Try to look alert, even if your mind is elsewhere. This list was put together with information provided by the links below. Visit them for more detailed advice. Local law enforcement and community leaders are eager to answer questions, so don’t be afraid to ask. Sign points Route 66 travelers to the new Goodwill Tulsa SW Blvd. store. We’ll be cutting ribbons instead of popping tags Thursday, July 10, when our new Southwest Boulevard store opens for business. The 2800 SW Blvd. store will close Tuesday, July 8, at 6:30 p.m. in preparation for the move. The grand opening celebration starts at 8:45 a.m. at 3110 Southwest Blvd., just a hop, skip and a jump from the current location. When the doors open at 9, shoppers will finally get to see the new expansive sales space fully stocked with the usual quality clothing and household items. One difference: Furniture will now be sold only at the Goodwill Auction, weekdays in our warehouse. The auctions are open to the public so you will still have a chance to get great deals. Pay particular attention to the Route 66 motif around the store. Rumor has it an extra-special commemorative item will be available. Note: The store at 2800 SW Blvd. will close, but donations will continue to be accepted at the donation center at our current location where an attendant is on duty 24 hours each day for your convenience. The new store will not have a donation center. We are extremely grateful for a generous grant from Microsoft through Goodwill Industries International that enables us to keep the users of our services — and ourselves — up-to-speed on current computer software, a crucial part of our training mission at Goodwill Tulsa. The grant helps us upgrade to Office 2013 in our Corporate Customer Service and Workplace Computer Skills classrooms. Students will then train and gain experience on the most current version of the Office suite, making their skills even more attractive to potential employers. Through the grant, we will be able to provide current software on our workstations at our new Goodwill Job Connection set to open in the fall. The new mid-town Tulsa location is expected to serve 550 people during the grant period. Members of the public will use up-to-date tools to search for jobs online and update their resumes, or attend short seminars on job searching. Our staff will benefit from the grant, as those who use a computer for their jobs will also have the Office 2013 suite. We anticipate improved workflow and job efficiency as some outcomes from the upgrade. We also look forward to being able to tell our stories — externally and internally — in more dynamic ways. THE QUESTION: Is there still value in donating one’s time and talent while on the job hunt? "5 Things You Should Be Doing If You’re Unemployed"
(From left) Claremore Goodwill® store team associate Liz Kallin, customer service manager Ramona Wimp and team associate Jeanette Bouchie represented Goodwill in the Pilot Club of Claremore Style Show and Luncheon this past April. Kallin and Bouchie modeled Goodwill spring fashions. Wimp put together their ensembles and the descriptions. Once again, this April, store manager Liz Campbell and her Claremore team prepared fashions and a fashion presentation for the Pilot Club of Claremore’s 35th annual Style Show & Luncheon. Ramona Wimp, our customer service manager, helped to orchestrate the Goodwill fashions and descriptions for the runway event. Team associates, Liz Kallin and Jeanette Bouchie, were the Super Models for Goodwill spring fashions. Guests beat a path to the store that afternoon to be the first to buy what they had seen on the runway at the Northeast Technology Center in Claremore. Retail sales director Rita Gilliam called it a tribute to Liz and her team that this is the fourth year that Goodwill has been invited to participate in this popular event. Claremore Goodwill® store team associate Jeanette Bouchie in her Goodwill spring fashion looks for the Pilot Club of Claremore’s annual Style Show and Luncheon. Claremore team associate Liz Kallin works the runway in a fine flowered sundress at the Pilot Club of Claremore Style Show and Luncheon this past April. Claremore Goodwill® store team associates Liz Kallin (left) and Jeanette Bouchie were models for Goodwill in the Pilot Club of Claremore’s annual Style Show and Luncheon in April. The TSA agent held a pink metal box with a rounded top over her head. Goodwill Tulsa Work Adjustment Training instructors and students take a tour of Tulsa International Airport on April 16, 2014. The heavy-looking item, about the size of a paperback, glistened as she moved it around, waiting for the intensely focused Work Adjustment Training students to identify it. They gasped when the agent flicked it open, realizing it was a jumbo lighter. Was it something that should be let through the security checkpoint and allowed on a plane, the TSA agent asked? “Noooo!” the students replied in unison. That was one of several insights into airport operations that the group gained during its recent half-day tour of Tulsa International Airport. Goodwill’s Work Adjustment Training program uses job shadowing and trips to business sites to give participants practical, real-life opportunities to apply what they learn in class. As they passed through each station on the tour, the students experienced the airport as a traveler and an employee. 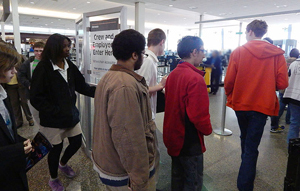 Students with Goodwill Tulsa Work Adjustment make their way to the security checkpoint, the second stop on their tour of Tulsa International Airport. 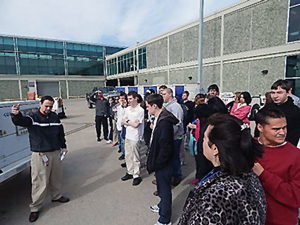 Pilot and tour guide Levi Brown explains how things run on the tarmac to Goodwill Tulsa Work Adjustment Training students at Tulsa International Airport. At the security check-in, they quickly removed shoes and belts, and emptied their pockets of metal objects into containers. Most of the group got the “big OK” going through the full-body scanner. After passing through, the students observed how the agents conducted their duties. As the wind gusted on the tarmac, the group listened to how a Jetway (or jet bridge) connects the terminal with an aircraft, allowing passengers to board. The guide stood in front a massive machine, explaining the various preparation and maintenance equipment. Everyone craned their necks looking for tugs, the “funny looking” cars airport workers drive. From there, it was a short walk to the inbound baggage unloading area. The students gathered around a conveyer belt that fed into an opening above their heads. A large bin served as stand-in for luggage and was placed on the conveyer. The group hurried back inside the airport, in time to see the bin emerge on the connecting conveyer belt in baggage claim. The last stop was at the Aviation Learning Center, an educational museum of sorts with working models, displays and flight simulators. Here, the students had a chance to use what they’d learned on the tour. Some played the role of travelers on fictional Tulsa Air Express Flight #0011, while their fellow students issued and took boarding passes, and watched for warning lights at the security scanner. On board, two students sat in the pilots’ chairs and another led the pre-flight safety instructions. The in-flight video covered the many career types in aviation from building to flying, guiding to instructing. Post by Goodwill Industries of Tulsa. We recognized these inspiring people at our annual awards luncheon May 6, 2014. Kelsey began working at Goodwill in July 2012, as a donation attendant at the 38th and Harvard locations. Kelsey greets donors with a wide smile, helps take donations into the work site and offers tax receipts with true gratitude and appreciation. She is always willing to lend a helping hand and say a kind word.This comes naturally to Kelsey who was born with Williams Syndrome, a genetic condition that is characterized by medical problems including cardiovascular disease, developmental delays, and learning disabilities. These occur side by side with strikingly advanced verbal abilities, highly social personalities and a love for music. The ongoing medical issues can cause anyone to have a bad day or even a series of bad days, but Kelsey carries on despite the challenges, always striving for a successful day on the job. 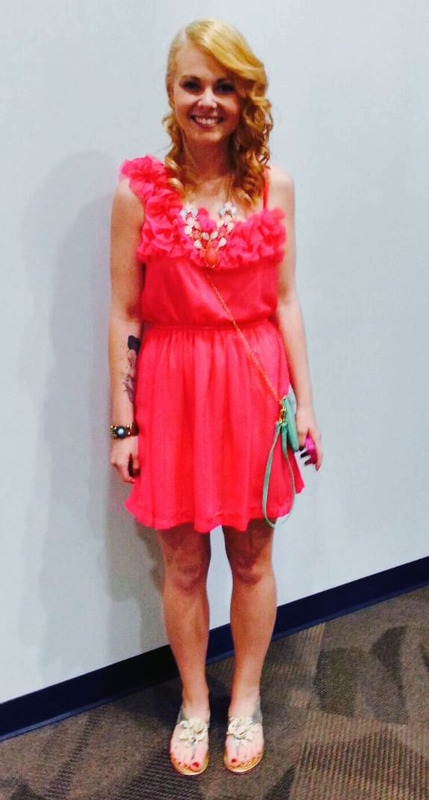 Before moving to Oklahoma, Abigail studied at Coffeyville Community College. There she developed a tutoring program for School District 445 in Coffeyville, KS, where she was responsible for 175 volunteers; matching them with students from kindergarten to 12th grade. Then everything changed. A few years ago, Abigail had a brain aneurysm, leaving her with lasting residual effects. Her short-term memory was greatly affected, requiring a significant amount of concentration for her to learn new things. Abigail made the decision to begin using Goodwill Job Connection in 2013 and soon learned of all the other services and training programs that where available through Goodwill's TulsaWORKS. She dove right in. Kyler Patrick began his association with Goodwill when he was a high school senior in 2011. He was a student in Goodwill's Transitional Work Adjustment Program in Owasso. He received classroom instruction on what was expected from employers in the workplace, how to take instruction from supervisors and how to behave on the job. After graduating from Owasso High School in spring 2012, Kyler took a year off to spend time with his family and decide what he wanted to do next. He then felt that it was time to go to work. In May 2013, Kyler was referred to Goodwill's Supported Employment Program. to be successful in work and life. Be inspired! Hiring events reduce the lag time between filing the application and the interview. On-the-spot interviews begin 9:30 a.m., last until 2 p.m.
Conference Room, Goodwill Job Connection, 2800 Southwest Blvd. You can request more information here . The Goodwill store teams are always looking for ways to create a fun shopping experience. For February’s Customer Appreciation Day, the Owasso store set up its Photo Booth again, with a mustache theme and props for customers. They also handed out "Hello, my name is" stickers and decorated the store with balloons that read "It’s all about you"　and "It’s your day." Well-meaning donors can mistakenly drop off things they wish they hadn’t. Photographs, keepsakes, personal documents — and even cash — get mixed in unknowingly with the wares and clothes that are given to Goodwill. It can take good detective work to reunite donors and unintentional donations. Like the case of the Misplaced Mementos. A processer found a birth certificate, marriage license and two baptism records. Thinking that they might be wanted by a family member, the processor turned them over to Eva. Her search started in the usual way, plugging names into Google. The marriage license was from Kansas, so Eva had a starting point. However, the couple also had a very common last name, making it an exhausting search. Eva found little on the woman, right away. There was a grade school listing but with a slightly different name. She forged ahead with the man’s name and finally found an obituary. A good clue: Items often end up lost when packing up a recently deceased family member’s home. His obit listed his wife and children. Eva kept digging. She found the wife’s obituary. It was in a Kansas paper, but listed her place of death as Tulsa and just a few months prior! Also listed was a daughter in Texas, who had an uncommon last name. However, searching that name only turned up a business website for a counseling service. Were they the same person? Eva took the chance and sent an e-mail. And she received a response: The owner of the service was the woman’s daughter. Her mother had passed away in Tulsa a few months before, she explained in the reply. The family didn’t know the documents had been donated. She was extremely grateful that Eva had alerted her and would very much like to have them. She asked that the items be sent her way. Eva offered her condolences. The documents would be mailed out that Monday, she wrote. “I appreciate your kind words and your efforts to find my mother's stuff a home. You're an angel,” the daughter replied. When she received the lost items, she was still amazed that someone would go to that kind of effort to return them. Being able to do so is a credit to the hard work and dedication of the Goodwill team members, who work diligently with the donated goods, Eva added. Goodwill Tulsa makes an effort to return mistakenly donated personal items. If you need assistance, call 918-584-1200. You can also e-mail info@goodwilltulsa.org or​​ post a message on our Facebook page. Time to stop putting off digging into that box of receipts or locating the file with all of your W-2s. Whether you are a newbie or old-hand, here are some things to keep in mind when doing your own taxes. Gathering all the documents and information you need before you start filling out the tax forms will save a lot of time. You don’t have to have neat piles with a color-coded filing system. You just want it all within reach while you work. It’s also good to make sure all your household information is correct and up-to-date beforehand. For example, double-check Social Security or tax ID numbers. Verify bank routing numbers; some financial institutions use a specific number depending on the type of transaction. Taking a few extra steps to see whether you can claim the Earned Income Tax Credit could pay off. The credit is available for families and individual filers. Reports say that one in five Americans is unaware that the filer qualifies for the EITC. You might feel secure that your refund can’t be stolen because you’re doing your own taxes. But remember, identity theft is a big problem around tax time. So, it’s crucial to understand how your information is being handled. Try to have an idea of what safety protocols are in place when sharing information, both online and with a tax preparer. You should choose to file your taxes in the way that you feel most comfortable. Paid preparers can provide needed expertise especially with complicated returns. Make sure to pick a reputable and (preferably) licensed tax preparer. Tax software guides you through a return and the better ones check for credits, deductions and errors. Filing online can be less expensive and even free. And you don’t have to go it entirely alone. Organizations offer free tax prep to filers who meet certain requirements. These handmade Valentine's Day cards were made by Goodwill Tulsa staff for area veterans. Valentine’s Day was once again a chance for Goodwill Industries of Tulsa to show love to our veterans. Goodwill staff prepared 372 Valentines for veterans in VA hospitals and nursing homes in Oklahoma and Arkansas. The creative outpouring was in support of “Valentines for Vets,” an annual program coordinated by Cherokee Nation. This was the third year that Goodwill Tulsa participated. Overall response this year was huge: Cherokee Nation received just over 4,500 Valentines. The crafting session had the jovial feel of a grade-school art class. The small group of crafting volunteers cut, folded and weaved colored paper into heart-shaped cards. Some used scrapbook paper to make beautiful Valentine’s Day cards. Others signed pre-made cards, addressing them to “Our Hero” and including words of thanks from the individual or Goodwill. The Goodwill Tulsa volunteers used a pattern to make their crafts. Cherokee Nation delivered the Valentines to VA hospitals in Muskogee and Fayetteville, AR; VA nursing homes in Claremore and Talihina; and VA clinics in Jay, Vinita and Tulsa. The organization had enough Valentines to add some local nursing homes, assisted living facilities and Cherokee Nation Senior Nutrition sites. For the Goodwill Tulsa team, it was time well spent. Employers. Social service agencies. Tulsa-area business community leaders. All can find opportunities for interaction and engagement at Job Connection. Employers are encouraged to post open positions with Job Connection. Facilities are available for hiring events at the South Annex at 2800 Southwest Blvd. But those employers discover that Job Connection can offer them more. The BAC is an advisory board of human resource representatives from Tulsa and surrounding communities. The council provides a forum for ongoing dialogue between business professionals, who are focused on identifying issues and discussing possible solutions. Members participate in the mock interviews, job fairs and other activities. The BAC’s quarterly meetings feature an interesting and informative business presentation; and time to network with other professionals in the community over light refreshments. The council is scheduled to meet Wed., March 26 from 10 a.m. to noon at the South Annex. Clients practice their interview skills as part of the TulsaWORKS training program. These mock interviews are also a great opportunity for companies to evaluate or enhance their applicant qualifying process. Representatives participate in the practice interviews, which helps give the students an authentic, real-world interviewing experience. Upcoming mock interview dates are Friday, Feb. 21 and Friday, April 1, from 9 a.m. to 1 p.m. Goodwill Tulsa hosts two a year, one in the spring and one in the fall. Representatives have face-to-face interactions with job seekers, and other companies and agencies. Past attendees have brought pamphlets, video presentations and giveaways. Applications or application information are on- hand and some applicants are interviewed on-the-spot. Laptops with Internet access are available to complete applications online. This year’s job fairs are scheduled for Friday, May 9 and Thursday, Oct. 2, 10 a.m.-2 p.m.
Click here (link) for more details about Job Connection and how to connect with what it has to offer businesses. Every now and then, the calendar lines up in a way that makes thrift shoppers giddy. A "winter" sale in 60 degree weather? Who’s complaining?! All women’s, men’s and children’s clothing will be 50% off regular prices. All of our 11 stores will open early Saturday at 8 a.m.
Everyone 55 and older is eligible for a 25% discount on the entire purchase of regular price items. This sale comes twice a month. But with it falling on the tail end of the other two, that’s a lot of potential savings. Call it one of the perks of being a "seasoned shopper." In order to keep offering these great sales and to have funding for our job training programs, we need donations. Help keep our donation and retail teams working and our stores racks and shelves filled. So, if you’re more in a giving mood than a shopping spirit this weekend, think of us. The Martin Luther King Jr. holiday has become a day of service for many communities. Alongside the commemorative events and celebrations are volunteer projects, offering people a chance to help their neighbors. In this way, we honor King’s philosophy of being a force for social good and social change. “When people are serving, life is no longer meaningless," said John W. Gardner, former Secretary of Health, Education and Welfare and founder of Common Cause. How and where can you lend a hand? 4. Goodwill has ongoing volunteer opportunities in our processing department at 2800 SW Blvd., stores such as Garnett, Broken Arron and Stone Creek, some donation centers. Sign up through Volunteer Tulsa: http://bit.ly/1asOYq4 Volunteer options are also available in our training programs and at Job Connection. We have internships as well. Please sign up below to post a comment, share your ideas and to see our special MLK Jr. Day Spirit of Service board on Pinterest. Note: You might have to click on the post's headline to get the comment option. Stephen Caffey makes follow-up calls for Job Connection at Goodwill Tulsa on Jan. 10, 2014. On Wednesday, December 18, I was making follow-up calls for Job Connection. I had probably made 25-30 calls. A few of these calls produced verification of some of these folks finding work. About 1:30-2:00, I placed a call to a young lady by the name of *DW. When I announced where I was calling from, this young lady immediately burst out with excitement. She had secured a job with Target. She told me that she had made them aware of some personal struggles ahead of time. They gave her a shot [hired her] and they love her work. She’s very happy to be there. Her energetic excitement spilled out to me for about 10 to 15 minutes! I don’t personally know *DW, but after hearing her story, I’m so excited and happy for her. Her story has made me proud to be a part of Job Connection. I hope to hear similar stories in the future. Stephen Caffey of ResourceMFG is a volunteer at Goodwill Job Connection. Find the perfect apartment with Apartment Guide!